We Have Continually Grown By Providing Quality Deals At Low Prices. Switch to “Switch/Wii U” or “PC” mode by using the switch located on the back. Compatible with Windows XP, Vista, Windows 7,Windows 8, Windows 10 and Mac OS under the PC mode. Switch to "Wii U" or "PC" mode by using the switch located on the side. Compatible with Windows XP, Vista, Windows 7,Windows 8,32 bit and 64 bit and Mac OS under the PC mode. Fit For: Nintendo Wii U and PC. Switch to "Wii U" or "PC" mode by using the switch located on the side. Compatible with Windows 2000, XP, Vista, Windows 7, Windows 8, Windows 10, 32 bit and 64 bit and Mac OS under the PC mode. Original nintendo wii u power adapter Original nintendo wii u power adapter Made by nintendo not compatible with wii console. Included:Wii U Ten Foot Charging Cable. Platform:Wii U. Model:Wii U. Compatible with Wii U. Connect via USB ® port. Extra-long 10 ft. long cable. We will do our best to resolve any problems that may arise. This device cable allows for the connection of any USB enabled peripheral with a (5 pin) mini B port to a PC or Apple Macintosh computer system. USB A to Mini B 2.0 Device Cable (DATA TRANSFER CABLE). 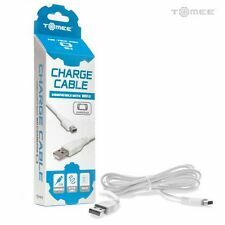 This component cable is specifically designed to provide the sharpest video and sound for your gaming system. Now you can get the high-quality images your Wii is capable of putting out. It allows for a more improved picture than RF, composite or S-video cables are capable of producing. Model # 0000658. DONGLE WIRELESS RECEIVER ONLY. Guitar Hero Live. PLAYSTATION 3 or Nintendo Wii U.
Wii U Power Cable. They work very hard to get quality products to you quickly. Supports the GC/Wii Emulator Dolphin. Switch system and PC USB. Switch to “Wii U” ,"Switch" or “PC” mode by using the switch located on the side. the adapter into your Wii U system or PC USB connector ports. Genuine Nintendo Switch HDMI Cable Cord OEM Official - Black. Compatible with the Nintendo Switch Console. OEM/ORIGINAL/OFFICIAL/GENUINE NINTENDO PRODUCT! These are the updated version that works with all Wii remotes, including Motion Plus remotes.How to connect?. The button A, B, X, Y, L, R and Z can be customized with TURBO. Ideal for HDTV. Connects to component equipped TV PC monitor or projector video inputs. High resolution graphics, up to 480p. Five foot in length. This USB cable is ideal if you wish to sync data between your Nintendo Wii U and your PC. The real color of the item may be slightly different from the pictures shown on website caused by many factors such as brightness of your monitor and light brightness. 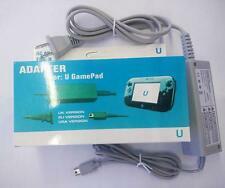 Wii U Pad Console. Output: DC4.75V 1.6A. Input: AC 100V-240V. 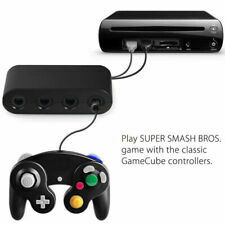 Official Nintendo GameCube Controller Adapter | Switch & Wii U | OEM | FAST SHIP. Condition is Used. Shipped with USPS First Class Package. 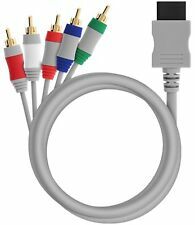 Get the highest level graphic output possible from you Nintendo Wii with these Enhanced Definition (480p) Component Video/Stereo Audio cables. These cables provide stunning video and high quality stereo audio. A must for any true gaming enthusiast. 100% Brand New! 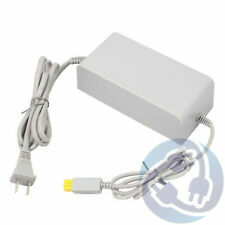 This Component AV cable is exclusively for use with Nintendo Wii console. 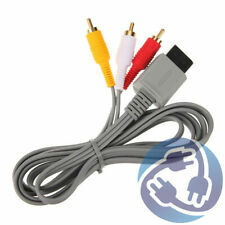 This cable can be used with any TV that has component video inputs (Y,Cb/Pb.CR/Pr). This cable will provide you with a much clearer image than the standard AV cable. Enables displays with natural and VIVID Colors. Color of Cable & Connectors: white. For use with Nintendo Wii. 6ft length. Output: DC 15V 5A. Nintendo Wii U Console. Power: 75W. We will work on resolving your particular case ASAP. Just give us the opportunity to resolve a problem. Item is in good and clean condition. Tested, fully functional. Compatible Platform: Wii U, PC. Current Generation. Last Generation. Connect via USB port. Type: USB Charging Cable. Mouse, Keyboards & Keypads. 24 HR RESPONSE. Extra-long 10ft cable (approx. ). 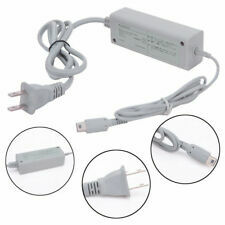 Genuine OEM Official Nintendo Wii U Gamepad Charging Cord Cable AC Adapter. Condition is Used. Shipped with USPS First Class Package.